If your home, office, garden or even your garage is lacking space thanks to junk and waste then why not get rid of it the easy way? Clearing your property could take up hours – or even days – of your free time, but if you call Go Rubbish Go then we’ll get rid of your unwanted waste for you! We have a range of professional waste disposal E5 services, including everything from general rubbish removal to garden waste clearance, so that you won’t need to lift a finger to get a clearer living space! We serve all properties in the E5 and E8 areas, so if you live nearby and want help with general waste moving or even something like furniture disposal, we can help you! Our company has been in the business for many years, and in that time we’ve provided lots of homes and offices in Hackney, E9 with fast, reliable and efficient E5 waste clearance help. Whether you need us for your home or even for your garden, you’re just a phone call away from the professional Hackney rubbish removal help that you need! Find out more and hire us today by calling now on 020 8610 9182. For Hackney Rubbish Clearance Professionals , Contact Us Today! No matter what sort of a job you might have on your hands, our company is just waiting to help you. 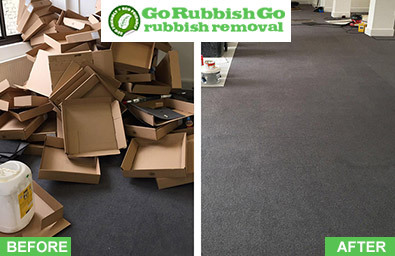 Go Rubbish Go is the best Hackney rubbish disposal company for help with everything from your office clearance to your basement junk clearance, and with our low prices you’re sure to be more than impressed! Choose our Hackney rubbish clearance experts and you’ll get cheap prices and fantastically competitive rates, no matter what service you’re in the market for, and with no hidden fees you won’t have to contend with any nasty surprises. I don’t know what I would have done with my old furniture if it wasn’t for your waste collection service. I’ve already told all my neighbours in Hackney, E5 about your services – you should expect at least a couple of phone calls real soon! Contact Us Today For All Your E5 Rubbish Clearance Needs Today! Get in touch with our experts today and we’ll even give you a free price quote with no obligation needed! If you live in the E5 district then we’re just waiting to help you, so why settle for anything less than the best? We have flexible services times, fast workers and guaranteed services, so you can be sure that we’ll never let you down! 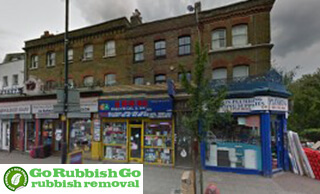 If your home or office is in the E9 area then find the rubbish disposal experts that you need with our company today. Pick up the phone and call 020 8610 9182 now for the professional and dependable junk removal in Hackney that you deserve! Are you having a clear out and are in need of a quality rubbish disposal in Hackney, E5? Well, then you’ve definitely come to the right place! 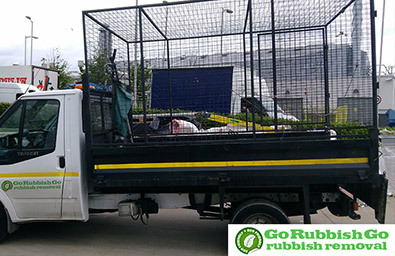 Here at Go Rubbish Go, we are experts at everything to do with rubbish removal. Our quality services have been helping people like you for many years now, and are truly the best in London. We have built up a solid reputation due to our attention to detail and our services which are tailored to the specific needs of our customers. That’s why no waste removal task is too big for our team to handle. Call us now and you will get a heavy discount! Hackney is located in the London Borough of Hackney. The borough itself is found in the north east of London, close to areas including Islington, Haringey, Waltham Forest and Newham. There are many Grade listed buildings in Hackney, but perhaps the most famous of these is the Hackney Empire, a popular Grade II listed theatre that was built in 1901 as a music hall, and is now a venue for musicians, comedians and more. Other sites of interest in Hackney include the National Centre of Circus Arts, Sutton House and the Geffrye Museum. Hackney’s closest Underground railway station, Manor House can be found near to Haringey, but that doesn’t make Hackney a difficult place to travel within. The North London Line and the East London Line over-ground railways make commuting easy, and Hackney is also home to many bus routes and services. National Rail’s Lea Valley Lines also move through the area.